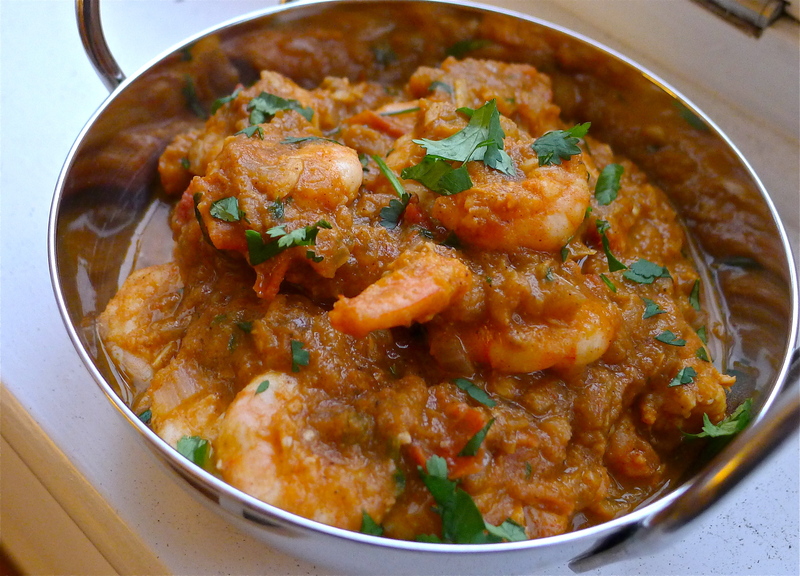 Prawn curry or jhinga masala isn’t something that my mum ever cooked. But I love prawns so I hunted down a recipe and then over the years, adapted it to my taste. South Indian prawn curries are very different (and delicious). They use tamarind, coconut milk and mustard seeds. This recipe is more tomato-based and relies on that simple but magic combination of onions, garlic and chillies followed by cumin, coriander and more chillies! Marinade the prawns if you want a deeper flavour and you have half an hour to spare. De-vein the prawns, combine the marinade ingredients (if using) and mix. Cover and refrigerate for at least half an hour. Heat the oil on a medium flame. Add the diced onions and cook until starting to colour, about 10 minutes. Add the green chillies and garlic and mix for 5 minutes. Don’t let the garlic burn. Add the tomatoes and cook until soft and collapsed, about 10 minutes. Add the coriander, cumin, chilli powder and salt and mix through. Cook until the oil separates out. ** Add half a mug of water and mix. Cook until you get the desired consistency (not too watery, but not super-thick). Taste and adjust for salt and chilli levels. Use a hand blender to smooth out the masala. Add the raw prawns and heat until cooked through (5-10 mins). Take off the heat, mix through the fresh coriander, and add a generous squeeze of lemon juice. Serve with cumin rice or roti. NOTE ON CHILLI: The green chillies I refer to are the tiny ones you can get in supermarkets (often in mixed packs). They are quite strong. If you don’t like your curry too hot, skip the chilli powder in the marinade. And use either the green chillies or the chilli powder in the masala, ie not both. Remember there is an opportunity to taste and adjust after the oil has separated out. ** If at this point you think it needs more salt or chilli, add it. If you think it’s too hot, there are two things you can do. Add a bit more water and reduce the masala again. Or mix through a couple of tablespoons of yoghurt when you take the pan off the heat to serve. It would be nice if you would add USA measurements to the recipes and also stores in NYC where we could purchase ingredients. Thanks.